You must be 25 years of age or older to reserve and book a vacation property. This Rental Agreement is a legally binding agreement between the Guests, Miss Kitty's Fishing Getaways, and the Home Owner. By making a reservation with us, you are agreeing to the terms and conditions as stated below. These terms and conditions have been updated on 1/01/2016. RESERVATION REQUIREMENTS - A payment by credit card of 50% of the total rental fee is required when booking a reservation. You will receive an email confirmation of the payment and details of the reservation. The remaining balance is due no later 30 days prior to your check-in date. By accepting the terms of this rental agreement, you authorize Miss Kitty's to automatically charge your credit card on file for your remaining balance unless you make other payment arrangements. We accepts Visa, MasterCard credit/debit cards, American Express, and Discover. Reservations placed within 30 days of check-in date will require payment in full at the time of booking the reservation and must be paid with credit/debit cards only. We only accept checks on reservations made more than 30 days before the check-in date to allow for time for processing. If paying by check, payment must be received no later than 5 days after booking your reservation or the reservation will be cancelled. Please reference reservation dates and confirmation number when sending checks. MAXIMUM OCCUPANCY - The maximum number of people allowed in each home is stated on your reservation confirmation. It also states how many adults and children are in your group. Please make sure this is accurate. The occupancy limits are set by the homeowners and are strictly enforced. Any child two years old and above is considered an occupant & must be included in the occupancy total. IF YOU ARE FOUND TO EXCEED THE MAXIMUM OCCUPANCY LIMIT OF YOUR HOME, IT WILL BE CONSIDERED A BREACH OF CONTRACT AND WILL RESULT IN IMMEDIATE EVICTION, LOSS OF YOUR SECURITY DEPOSIT, AND NO REFUNDS OR REBATES. We reserve the right to come to the rental house and check the number of people using the facilities, and we have people in the various neighborhoods that report to us if there are too many people at a house. VISITORS AND PARTIES - Renters are not allowed to invite guests to the rental homes for parties, bbqs, weddings, or for use of the facilities if it is going to put you over the maximum occupancy limits. The house and its amenities are strictly for the use of the renters. If you want to have a gathering with people other than in your rental group you will need to make arrangements to do so at a public place or meeting facility. You can call us if you need help finding such places. Violating this policy can result in loss of your security deposit and eviction from the property. RV'S, campers, or trailers ARE NOT PERMITTED at any of the properties. CANCELLATION POLICY - Cancellations must be submitted in writing and confirmed no later than 30 days prior to the original check-in date in order to receive a refund. All cancellations are subject to a 10% service charge. No refunds are given for cancellations, changes, or rescheduling done after 30 days prior to your arrival date. NO EXCEPTIONS. We highly recommend purchasing travel insurance to avoid losing your vacation investment due to unforeseen cancellations. You may purchase travel insurance at the time you make this reservation or call the office to purchase it at a later date. RESCHEDULING AND CHANGES - You may reschedule or change your reservation up to one time free of charge after your original reservation. All future changes or rescheduling of your reservation are subject to a $25 processing fee for each rescheduling. All rescheduling must be done prior to 30 days before your arrival date. No refunds or rebates will be offered for guest's inability to arrive on scheduled date or who have to depart early for any reason. SECURITY DEPOSIT - All reservations require a security deposit or damage waiver fee (see section below). The security deposit amount will be authorized to your credit card up to one week prior to your check in. In the event that your credit card is declined, you will be required to either provide a valid credit card or pay the security deposit in cash before admittance to the property is allowed. A personal check may be accepted for the security deposit only if it is received in our office 14 days before your arrival date. Security deposits will be returned within 7 days of your departure after inspection of the property. Fees for damage, breach of contract, or extra cleaning required will be deducted from your security deposit. To ensure a full refund of your security deposit, we will provide you with a check-out checklist and set of house rules. DAMAGE WAIVER FEE - As part of your stay you are required to purchase a damage waiver designed to cover unintentional damages to the rental unit interior that occur during your stay. The policy will pay a maximum benefit of $1000-$2000 depending on which level is required for your property. Any damages that exceed that amount will be charged to the credit card on file. Intentional damages to the home or property will be charged to the renter. HURRICANE POLICY - There are no refunds due to inclement weather including hurricanes. We offer vacation rental insurance that not only protects you against hurricane losses at your destination home, but also at your place of residence. Please look over the CSA travel protection that we offer to see if it is right for you. CSA TRAVEL INSURANCE - We offer travel insurance through CSA Travel. Protect your vacation dollars from loss due to hurricane, illness, injury, or other circumstances beyond your control. Look over the policy offered to see if it is right for you. PET POLICY - Pet friendly homes are listed as so on the property information page. In those homes, the following terms and conditions apply: A non-refundable pet fee is charged per stay for all pets. Absolutely no more than 2 pets allowed. Pets must be completely housebroken, well behaved, and pest free. Pets are not allowed on furniture. Guests will be charged for additional cleaning for removing pet hair and other pet-related material from furniture or the yard. Guests may not use any home provided linens or towels on pets Pets shall not be left uncrated while alone on premises. Guests agree to pay for any damages caused by pets. If pets have an accident in cabin, all clean-up will be performed by the Guests. Guests must agree to clean up all outdoor pet waste and deposit in outside garbage cans. Failure to comply with pet clean-up policy on the premises may result in additional cleaning charges that will be charged to the guest's credit card. Guests agree to be in full control of their pets at all times and take full responsibility for their pets well being. Area leash laws must be followed. If any of these Pet Policy items are not met, Guests are in violation of this Agreement. Guests agree that by signing this Agreement, they are authorizing Agents to charge Guest's credit card on file for any damages sustained as a result of pets. BRINGING A PET TO A HOME THAT DOES NOT ALLOW PETS WILL RESULT IN IMMEDIATE EVICTION, LOSS OF SECURITY DEPOSIT, AND NO REFUND OR REBATES. DAMAGE, CLEANING, AND MAINTENANCE: Each home is privately owned, furnished, and equipped by the homeowner. Guests agree to take responsibility for treating the home with care. Do not remove furnishings or kitchen items and do not move furniture around. Rearranging or moving of furniture is prohibited and may result in additional fees due to extra housekeeping services. Guests agree to properly use and operate all furnishings, appliances, home entertainment items, BBQs, etc. during stay. Guests will be charged for any damage or destruction of property caused by the guest, or for extra cleaning required. Please report any problems - you will not be charge for routine maintenance and normal wear and tear. Certain areas in each rental property are locked for the owner's personal storage and guests may not access these areas. Guests are responsible for doing their own dishes and properly bagging the trash and taking it out to the street. CABLE/SATELLITE TV - All of our properties have cable or satellite TV, however properties are individually owned, and we cannot guarantee TV channel availability. Rental properties do not necessarily offer premium packages, i.e., Movie Channels, Sports Channels, Pay-Per-View, etc. Occasionally there are interruptions in cable or satellite service due to unforeseen circumstances. We do not guarantee the availability of cable or satellite service. No refunds or rebates will be offered if cable service is down or dvd players do not work, but we will make every effort to correct the problem in a timely manner. CONDUCT - Rental homes are located in neighborhoods. Occupancy and use of premises should not disturb or offend neighbors or residents by means of parties, excessive noise, obnoxious behavior, excessive speeding through neighborhoods, discharge of fireworks, or any other noise-inducing mechanisms. Agents reserve the right to terminate this Agreement and evict Guests with no refund or rebate who engage in these behaviors. Quiet time is 10:00 on weekdays and 11:00 on weekends. BBQ GRILLS - Guests who use the BBQ grills are responsible for cleaning them after their use. Guests may be charged up to $100 for cleaning of the grill. Properties with propane grills are fueled by liquid propane and under NO circumstances may Guests add charcoal or any derivative of charcoal to the propane grills. If Guests add charcoal to a propane grill, guests may be charged for the replacement of the grill. Guests are responsible for providing any charcoal or propane that may be needed. CHECK-IN TIME IS 3:00 PM - Check in is 3:00. There are NO EARLY CHECK INS FROM MEMORIAL DAY WEEKEND THRU LABOR DAY WEEKEND - NO EXCEPTIONS. Sometimes during the off season, homes are available for an early check in, but this is not guaranteed. If you are interested in an early check in, contact us the day before your arrive. There is no early check in available if other guests are checking out the same morning. On those days we will make every effort to make sure the home is ready by 3:00, but sometimes cleaning takes longer than expected which could cause delays in check in. Please allow the cleaning crew to finish their job before you enter the house. CHECK-OUT TIME IS 11:00 AM - THERE ARE NO LATE CHECK OUTS FROM MEMORIAL DAY WEEKEND THRU LABOR DAY WEEKEND - NO EXCEPTIONS. The cleaning crew must have adequate time to prepare the property for the next guest. Guests that do not vacate the rental property and return the keys by 11:00 AM will be charged a MINIMUM $100 late check out fee that will be deducted from your security deposit. This amount will increase by $25 for every 30 minutes beyond 11:00. During our off season, you may arrange for a late check out if it is available; however there may be additional fees for this. You can contact our office the day before your check out to see if a late check out is available. LOST KEYS - There is a $50 fee for all lost keys. If guests lock themselves out of a house, there is a $25 service call fee to provide access to the house - so please don't lock yourself out or lose your keys! If it is after business hours there is $50 lock-out fee. ITEMS LEFT BEHIND - Miss Kitty's Fishing Getaways is not responsible for any items Guests leave behind. We will collect all items we find that are left behind and upon request, we will return these items for a $25 handling fee plus shipping costs. All unclaimed items will be donated to Castaways to raise money for local charities foundations. SMOKING - All of our homes are NONSMOKING. If you smoke, please do so outside, away from the house and dispose of your cigarette butts. If you get smoke in the house, you will be charged additional fees associated with ridding the home of smoking residual. RELEASE OF LIABILITY - All guests agree to save and hold harmless the property homeowners and Miss Kitty's Fishing Getaways owners and employees for any loss, liability, damage, or cost that may incur during occupancy on or around the property including the pools, hot tubs, piers, boat docks, boat launches, and bulkheads. ALL GUESTS AGREE THAT ALL CHILDREN MUST BE ACCOMPANIED BY AN ADULT ON THE DOCKS, PIERS, BULK HEADS, SWIMMING POOLS, OR ANYWHERE ON OR NEAR THE WATER AT ALL TIMES. 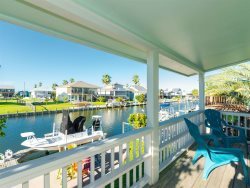 Guests assume the risk of injury or other losses relating to any recreational activities and will hold the home owners and Miss Kitty's Fishing Getaways owners and employees harmless with respect to this.